I have finally managed to get my Fritz Box 7390 working on BT Infinity. Unlike the recommendations for setup that I have read elsewhere, I can only get a a sensible connection by selecting "detect automatically" for the connection settings. However, I am puzzled by the slower speeds over the BT modem/router combination. DSLAM max statistics show 40000 kbit/s for down, 10000 up. However, the attainable throughput shows as only 33448 down and 5496 up. This compares with the speeds I get using the BT gear of around 37 Mbit/s down and about 8 up. In my case, I am not too worried about the down statistics but I am worried about the up ones as I need the highest possible speed (video editing). This means the Fritz Box doesn't seem to be the most suitable, which is a shame as I very much like what it offers. I can use it downstream of the BT modem and router with no problem, but that means three boxes instead of one. Can anyone explain to me why this anomaly exists? It is as if the FB is imposing a limit rather than BT. ISTR that this problem was related to the use of Jumbo frames which the Infinity kit uses, but 3rd party equipment doesn't. Greetings and thanks for that info Batboy. Now trying to find my way around the subject of "jumbo frames" and "mtu"s. Near as I can make out Jumbo Frames seem to be issues on my ethernet side while mtu seem to be the Internet side (or both actually). I know that is a simplification and I may be wrong, but it seems JFs are not involved in the Infinity side. The Fritz Box can have alterations made to the configuration file - currently showing Internet MTU as 0, which I guess just means default. Have you spotted any useful discussions on these subjects? I have found lots of mentions in threads elsewhere, but as a Newbie to this detail, it is a little confusing. Not sure whether altering the mtu setting would affect my upload speed or not. It could be that your various attempts at setting up the F!B have been seen by the DLM as instability. After a year of holding a 79992/20000 connection, my F!B lost synch and never regained it. With an ECI modem it worked fine as a LAN router. The result of all my fiddling was a massive synch drop which a week later has yet to recover fully. Whilst I still think that my issues were line- related, AVM offered to replace my 2 year old box without any diagnostics based on the fact that the ECI modem is working on my line. I have to receive my replacement router. Thanks The_Voyager. My modem is an ECI, not a Huawei. Don't know how much difference that makes, but just to be clear, I am connecting the FB to the FTE direct - bypassing all the BT stuff. 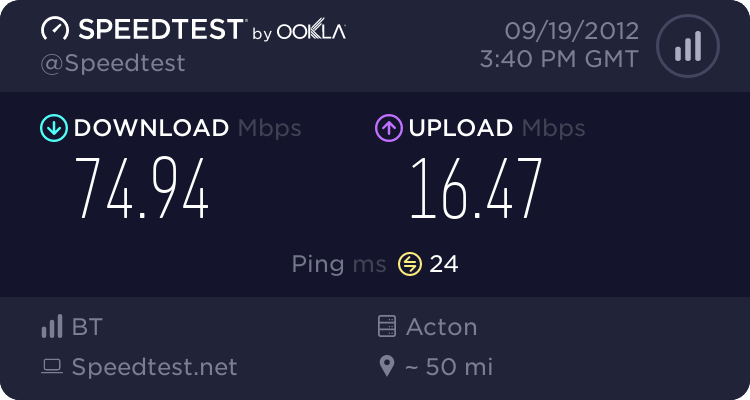 The FB reads the downlink DSl as 31.7 and the up as only 5.3 - both well below the speeds the BTW speed test and Speedtest.net and Tbb speed tests return. As a compromise, I would be happy to just plug the FB into the ECI modem as a router, only I can find no way to get that to work without the HH3 in between. None of the other options in the FB 7390 seem to work with the ECI modem. Firmware version 84.05.22 is installed in the FB - which means CLI works correctly (for anyone still having problems). I can assure that the F!B 7390 does support PPPoE over LAN. You need to go into advanced settings and Account Information and I think that is the bottom of the 3 options. The page should change to give you the option of setting up your ISP username and password. You also need to set up the up and down speeds for your connection (80000/20000). Plug an ethernet lead from the LAN output on the ECI modem to the LAN 1 port on your Fritz!Box. All you need to do know is pull the power lead out of the ECI modem - wait 10 secs - and plug it back in. Bingo. The fibre data point is your ECI modem. Ignore the reference to setting 999999: set 80000/20000. Don't be tempted to ignore these settings as your speeds will drop like a stone. I know this from experience!!! You can get problems if the modem is not compatable with what is at the BT OR end, so that could be why you are getting a drop in speed using it directly.